Since: Founded in 2012, and has been under current ownership since 2016. Katarina: I’ve lived a few different lives and feel lucky to have done so. I am originally from Houma, LA and went to Texas Christian University to study English and Music. I ended up dancing and performing professionally. That’s where I first picked up Ballroom dance. After living in the Northeast for several years, I was ready to come back home to New Orleans and one of the first things I did was attend an Argentine Tango class. Upon entering the studio, I immediately felt at home and became friends with the other dancers and instructors. I grew close with the founder of Dance Quarter, Natalie Gomes, and began teaching at her studio. Later on, she approached me and asked if I was interested in becoming the owner of Dance Quarter—I accepted! It was a wonderful opportunity to influence the New Orleans dance and creative community. New Orleans businesses have flavor! I feel like every block and every store has a story. The businesses in this neighborhood are reflective of that. There is something here for everyone. If you can’t find a particular item or service in your area, you have to seek it out! It is just a matter of figuring out which communities and which stores offer it. Here in New Orleans, I believe this city is a place where anyone can fit in. I find that people will open up their homes and their business spaces. They’ll open up for almost any reason to create a space for the community. It is beneficial when business owners are able to support one another. Jessica: It would be a Long Island Iced Tea, because there is a little bit of everything in it. 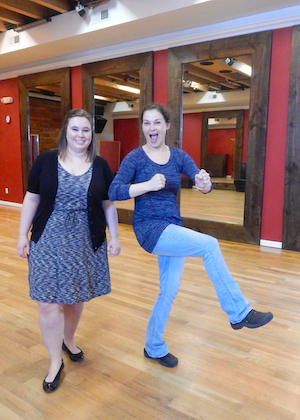 When you come to Dance Quarter, you know you are going to have a good time. Katarina: I like the Tom Collins drink. It has a classic refreshing taste where you know you are going to get quality with a kick. It is a coincidence that my harmonica player is also named Tom Collins! He is 70 years old, larger-than-life, and still kickin’. Katarina: We’re an open place that offers dance and fitness. We get people moving and foster relationships between people and groups. We hope to change someone’s day and make sure that they are in good company. When students come to Dance Quarter, they do not come to just learn about music and dance, they come to learn something about themselves. Similarly, people who come here are searching for something, and hopefully they find within themselves confidence, grace or friendship through dance. Can you highlight success in your business? Katarina: We have become a part of the fabric of the community. In doing so, we have developed close relationships with various organizations. We recently hosted a prom for a non-profit organization. We have had a several book signings and theater productions here. For one of our past events, we partnered with Lavender Ink Press. That’s what I enjoy about this business, it offers the opportunity to collaborate. We also share this space with Upturn Arts, a non-profit organization that teaches children in the community to explore and build confidence in themselves as artists. Dance Quarter is a multi-use space. Jessica: The history is rich here! This building has had several lives in this community. It was once a firehouse, then was redeveloped to be a mechanic shop, and then a recording studio. People who come in for class now, still have memories of coming to this place when they were younger. It is incredible to see how NOLA Spaces has evolved over time with the community. Katarina: We want to increase our offerings so that we can be more inclusive of different cultures and dance styles. I want to tap on my own roots and start a Louisiana heritage class with zydeco and cajun two-step. I also want to give people the opportunity to share their dance styles. We have a Cuban dance class coming up next semester; we also just added Bachata and are looking forward to expanding our Ballroom class and offering a Hip-Hop class. I want to have more children’s programing to get them dancing and moving too. Dance can have a positive impact on children. Children do not see social standing, race, or any of those things that tend to taint us as we get older. If we get them early, we can really touch people. I think it breaks through barriers and crosses lines that don’t ever have to be there. That is my dream. It is a good vision but implementing it is tough. Jessica: My favorite local business is the Prytania Theater. I enjoy going on Wednesdays to see their classic films. I watched one the other day, and it had a young Ronald Reagan in it. Every time I walk in there, I just feel so much better. Katarina: My favorite is Miss Claudia’s Costumes and Vintage Clothing Shop on Magazine Street. I got my boots from there and all of my costumes when I can. Her shop has so much character and has so much quirky stuff! Will you share you have a favorite local lunch or dinner spot? Jessica: Mine is Jamila’s on Maple Street. I think everyone should go. Whenever I walk in there, I feel like they are welcoming me into their home. Their son is the waiter, the husband is the greeter, and the wife makes all the food—it’s fantastic! I find myself enjoying the ambience so much that I have never been there less than two hours. Katarina: I like Pho Noi Viet. It’s a family owned Vietnamese restaurant. I also love that crepe store that just opened, Deville Coffee House and Creperie. They have grilled cheese crepes! They were really, really nice to me when I was super, super pregnant. I had one of those days where if I did not have a grill cheese crepe immediately, I was going to hurt something. They made me one real fast. I go all the time now and bring friends. Katarina: My best is advice is to be fair and nice. There is no point not to. For every situation that has come up at Dance Quarter, I aim to be fair and nice. You also must keep good people around you. I want to keep Jessica on forever! She is great at her job. When you have good staff who care about their craft and their students, you do not have to work very hard.